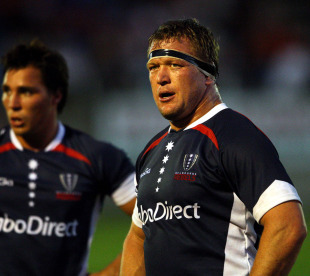 Former All Blacks prop Greg Somerville is set to retire following the Melbourne Rebels' final Super Rugby outing of the season. The 33-year-old former Crusaders and Gloucester forward, who won the last of his 66 Test caps in 2008, will join fellow Rebels Sam Cordingley and Kevin O'Neill in hanging up his boots after Friday's clash with the Western Force at AAMI Park. Somerville told his Rebels team-mates yesterday that a series of minor injuries had convinced him not to honour the second year of his contract. "After so many years the niggles continued to be there week in, week out and having to push through them has got to me in the end," he said. Rebels head coach Rod Macqueen regretted Somerville's decision and appreciated his contribution as a cornerstone of the Rebels pack. "He basically said: 'There's a time in your life where you've got to make a decision' and he thought that he's had a good year and he felt the time was right now to hang up his boots," the Rebels' outgoing coach Rod Macqueen told the Sydney Morning Herald. Fellow retiree Cordingley paid tribute to Somerville describing him as an "inspiration." "He's been fantastic. For me he's been probably our best player, our most consistent player," he said. "In terms of the work that he puts in around the place, turning up for training, it didn't matter if he had a niggling injury, I don't think he's missed a session this year. He's been a real inspiration for everyone, including myself. "'Yoda' [Somerville] is one of those guys who doesn't dilute the message too much. When he speaks, everyone listens. He doesn't say too much but when he does say something it's very important and it's always very succinct. When he speaks, I often look around the room and every set of eyes in the group is set on him, are pinned on him, so I think that's a sign of a real leader." Cordingley, 35, will call time on a 12-year career including two spells with the Queensland Reds and one with the ACT Brumbies in Super Rugby, as well as two spells with Grenoble in France and one with Swansea in Wales. Capped 22 times by the Wallabies, the scrum-half insists he has no regrets over his decision to retire. "It's been a long time coming but this will definitely be my last year. It's been a nice way to go out," he said. "It would have been nice to have been more involved but you can't look back and I certainly have no regrets … I've made a lot of friends worldwide, lived in great places and I've finished off living in probably the best town in Australia so it's been a great ride." Somerville will start at tight-head against the Force with O'Neill named on the bench while Cordingley is omitted from the squad.